Jang Keun Suk updated his IG with a new selfie of himself smiling brightly along with a typically British exclamation of frustration or anger, i.e. "cursing". Initially, he included #private in his comment but deleted the word almost immediately. The general feeling among eels is that he was angry because he saw pictures all over the internet of himself on the beach in Jeju-do, where he went for a private vacation. He really, really dislikes having his personal time/vacations invaded...and has often said so, even going so far as to deny a news reporter a photo op. Nevertheless, his smiling face and comments appear contradictory...but sometimes that's just Jang Keun Suk. Always enigmatic! An hour or so later, JKS posted another picture to his IG account. His frustration seems to have ebbed as you can see. If you're wondering what or where he took the picture he posted...well, it's part of the seawall where he was. 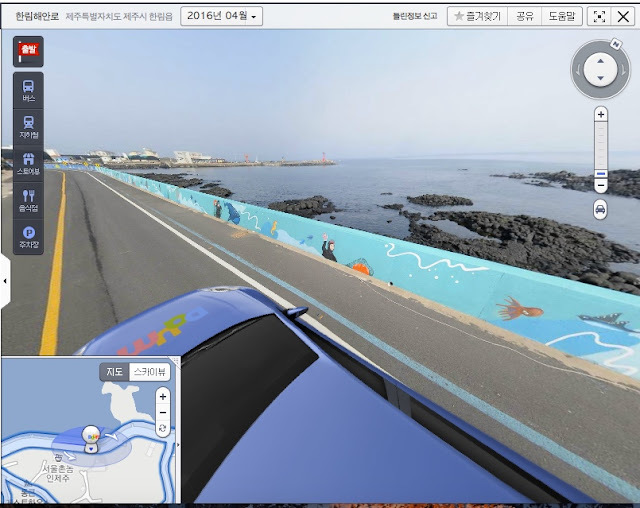 Here's a link to the 360 map of the road and seawall. Play with it. It's fun to see the mural on the wall. It sure beats a dull, gray concrete seawall! But JKS didn't stop at just two updates to his IG account in one day. After a few hours passed, he add a third update. Thanks for putting all of this into context :).